Recycled postage stamps (Aust) and Red Rose Tea (Canada) collector card all with the butterfly theme. Haven’t stopped by in quite a bit. Amazed at what I’ve been missing! Beautiful stuff Mandy! Sigh…love butterflies. What a beautiful way to use stamps up. I have a bunch of American ones that are defunct with the rate change that happened not too long ago. This is a great idea! 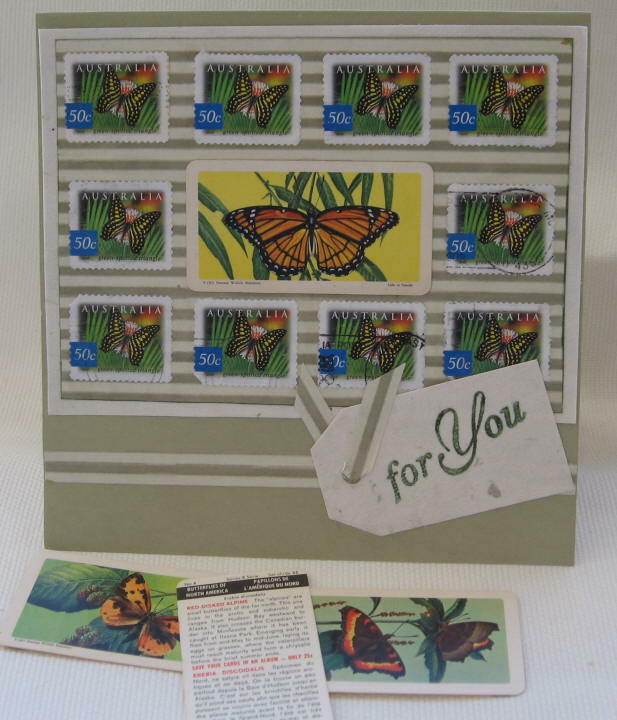 That’s a cool way to recycle the stamps and made a very pretty card! ohh – what a gorgeous idea!! !This looks so beautiful! Lovely lovely butterflies, Mandy!! So pretty, and creative. Well done! !